10% off any non-sale hardware. 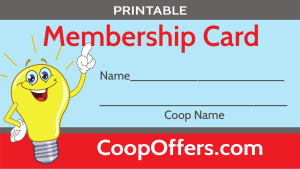 20% off for all Coosa Valley Electric Co-op card holders. Alabaster LTG & Electric, Inc.
Buy one classic roast beef sandwich get one free. 10% discount on landscaping and lawn care. Includes installation and maintenance. 15% off a case of wine. 15% off any repair; 10% off new over $100; 15% off new over $250; $50 off any class. Can't be used with any other offers. Buy one whopper sandwich get one free. Spend $50 or more and receive $5 off total bill. Not valid with any other discounts or offers. 25% off a membership fee.